Across the globe, glaciers are retreating. This melting has accelerated dramatically in the past few decades. Alaska is no exception, with 98% of the state's glaciers shrinking, losing over 20 cubic miles of ice each year. Globally, the melting of glaciers contributes to sea level rise. Locally, glacial retreat can change river and ecosystem dynamics. A glacier forms where more snow falls each winter than melts each summer. Over time, the snow compacts into ice. When the ice is thick enough, the glacier begins to flow downhill. The polar areas of Greenland and Antarctica contain over 95% of this ice, which amounts to more than half the world's fresh water. Glaciers outside of these two major ice sheets are often termed "small" or "mountain" glaciers. Due to its relatively cold climate, heavy precipitation, and high mountains, Alaska has one of the largest areas of mountain glaciers in the world -- at around 29,000 square miles, or 14% of the world's total. Trees fall into the water as ice calves from a stagnant ice cliff at the Sitkagi bluffs. Mapped at 200 feet high, the cliff has shrunk to around 60 feet high. Erosion of the moraine at the beach allows the ocean to reach the ice at high tide and during storms. Further encroachment of the ocean could set off the type of rapid retreat seen at other tidewater glaciers, possibly turning much of the glacier into a new fjord. Glaciers are sensitive to climate. A slight decrease in temperature leads to more snow accumulation and less melting (ablation), causing glacial growth. A slight increase in temperature leads to less snow accumulation (more precipitation will fall as rain) and greater melting, two effects that combine to cause glaciers to thin and retreat. Because glaciers are so sensitive to temperature changes in the mountains where they reside, they have been widely used as an indicator of local climate change. The global extent of their retreat is part of the evidence of global climate warming. The last sustained period of global glacier growth occurred during the Little Ice Age, with glaciers reaching their maximum extent between the 17th and mid-19th century. Since then, most glaciers have been retreating, with brief advances in some areas in the mid 20th century. Since the 1980s, glacial retreat across the world has sped up dramatically. Between the 1960s and 1990s, ice loss was already relatively fast - with an around of 8 inches of ice thickness lost for every square yard of glacier across the world. Between 2001-2004, this rate more than doubled. The best way to measure glacial retreat is through "mass balance" calculations - the difference between snow accumulation and melting for a given year. There are continuous records for 40 mountain glaciers across the world since the 1960s. From 1961 to 2005, these glaciers lost around 40 feet of ice - which extrapolates to over 2000 cubic miles across the world. Mountain glaciers have been melting at a faster rate than the Greenland and Antarctic ice sheets, so even though they contain only 4% of the total land ice area, they have contributed 60% of the sea level rise caused by melting ice since the 1990s. 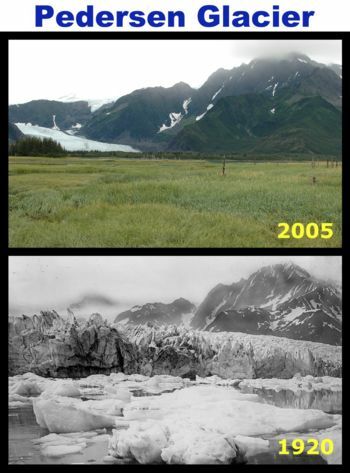 Comparison photos showing the decline of Pedersen Glacier in Kenai Fjords National Park, Alaska. Comparison photos of Muir and Riggs Glaciers in Glacier Bay National Park and Preserve, Alaska. Not all glaciers melt equally, even within the same region. Mass turnover is highest in low elevation maritime glaciers, and while the overall trend of glacial retreat is tied to the climate, the rate of retreat for an individual glacier is dependent on local glacial dynamics. During the second half of the 20th century, 75% of all the ice lost from Alaskan and connected Canadian glaciers was lost from a few very large and dynamic glaciers (Columbia, Malaspina, Bering, and LeConte in Alaska, and Kaskawulsh in Canada). Around 36% of Alaska's glaciated area is composed of tidewater glaciers (those calving directly into the ocean), or glaciers that recently were calving directly into the ocean. These glaciers deserve special mention for a number of reasons. They include some of the largest glaciers in the state, and along with lake-terminating glaciers they exhibit far more dramatic advances and retreats than glaciers that terminate on land. For example, the Columbia Glacier in Prince William Sound began retreating around 1980, and has shrunk back over nine miles in just a few decades. 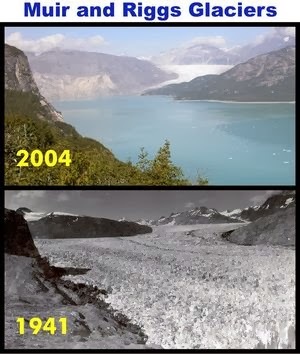 "The glaciers that once ﬁlled Icy Bay had shrunk dramatically. But shrunken is not gone, and each ﬁnger of the bay still ended in a great calv- ing face of ice, spitting bergs into the ocean as ice ﬂowed down from the peaks." The main reason for this is that iceberg calving leads to much faster ice loss than melting, and calving glaciers are far less stable. A tidewater glacier usually sits on an underwater moraine, built as the glacier deposits debris at its terminus. When a glacier thins and retreats from where it is grounded on a moraine, the deeper water at the glacier front will lead to an increase in calving and a rapid retreat. A re-advance can occur when the glacier rebuilds its moraine as it moves back across the fjord. Calving glaciers in Alaska are grounded on land. Therefore unlike the melting of sea ice, iceberg calving from these glaciers contributes to sea level rise. Nearly all tidewater glaciers in Alaska have undergone these cycles of advance and retreat, which are not directly tied to changes in climate. However, climatic warming appears to have initiated many rapid iceberg-calving retreats. Although large tidewater glaciers show the most dramatic changes and contribute the most to sea level rise, the effects of climate change can be seen more easily in Alaska's land-terminating glaciers, nearly all of which are losing ice. "We had been told that the calving would slow at slack tide. So we waited on the snow-dusted shore, packrafts in hand, listening as slabs of ice cracked and peeled from the miles-long face, collapsing into the water in a nearly constant series of rumbles and booms." Glaciers can advance while shrinking. For example, the snout of Guyot Glacier in Icy Bay is pushing forward, while the glacier overall is losing volume - thinning out as it advances. Surging glaciers often retreat dramatically between surges, shrinking on average. While nearly all Alaska's glaciers are shrinking, a few are actually gaining ice - most notably Hubbard Glacier near Yakutat, and Taku Glacier near Juneau. Retreating glaciers raise sea level by adding water to the ocean, either in the form of melt water or calved-off icebergs. Rising sea level can lead to greater coastal erosion, inundation of low-lying areas, and a greater sensitivity to storms. Currently, the retreat of mountain glaciers (glaciers not in Greenland or Antarctica) adds around 1mm to sea level each year, with glaciers in the Gulf of Alaska the biggest contributors. Melting glaciers are expected to cause significantly more sea level rise in the future. There is a large amount of uncertainty in estimates of future sea level rise, largely because ice dynamics are difficult to model. The 2007 IPCC report predicted 0.6 to 2 feet of sea level rise within the next century, but excluded ice dynamics as a factor. Modern predictions including ice dynamics are generally larger. One such prediction calls for a rise in sea level somewhere between 2.5 to 6.5 feet within the next century - mostly due to rapid retreat of calving glaciers. A third of the ice loss is expected to come from Greenland, and another third from Antarctica, with the final third coming from the sum of mountain glaciers around the world. Because Alaskan glaciers make up a relatively large portion of these mountain glaciers, and have a high rate of ice loss per unit area, they would be among the biggest contributors to this rise. "Giant lakes stand where there once was ice, and the band of bare gravel marking a former glacier’s extent reaches hundreds of feet up the sides of nearby mountains. Glaciers have been advancing and retreating along this coast for a long time – turning ice to bays and bays to ice again. And in our quickly warming world, most are shrinking faster and faster. As the glaciers shrink, the land bounces back from the weight of the ice, rising up out of the sea. Grassy dunes and fields of wild strawberry grow on former beaches, tiny christmas tree farms of young spruce grow on former dunes, and the young forests behind them grow older. The land is changing…"
The disappearance of glaciers can alter the flows of downstream rivers, increasing them in the short term due to rapid melting, but decreasing the total water flow over the long term. In areas of extreme glacial retreat, such as the Gulf of Alaska, it is possible that the short term increase in freshwater input could change local ocean currents. The long term decrease in river flow will probably be a relatively minor impact in wet Alaska, but could be significant in drier areas such as the Himalayas. Glacial retreat can expand both land and marine habitats at the margins of glaciers. Newly exposed areas of land are colonized by plants and animals, though it takes hundreds of years for this process to reach a mature ecosystem (such as forest in Southeast Alaska). Across Alaska, lichen and moss can be observed on the most recently deglaciated areas, while nitrogen-fixers such as alder are found in slightly older landscapes. As glaciers shrink, they change they reduce pressure on the crust, and decrease stability of existing faults - potentially contributing to earthquakes. In addition to direct geologic and ecologic impacts, in Alaska, glaciers are an important tourist attraction. Hundreds of thousands of tourists visit Alaska's glaciers each year. As the glaciers shrink, many of them are becoming less available to these tourists - retreating from visitor centers, retreating into shallow bays where cruise ships cannot follow them, or no longer calving into the ocean. If shrinking glaciers led to a reduction in glacier and cruise ship tourism, it could be a significant economic hit to the state.